In April 2015, the Karam Foundation, a Chicago-based nonprofit organization, launched its fifth Innovative Education mission for displaced Syrian children and youth. 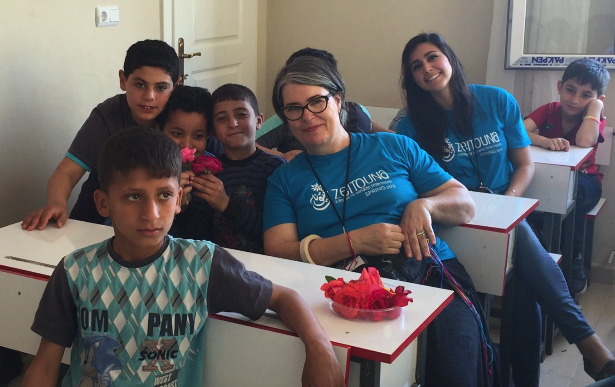 Karam’s team of more than 40 international mentors worked with upward of 400 Syrian students from four schools in grades 1–12, leading workshops that included entrepreneurship, arts, language arts, sports, yoga and full dental/vision clinics and screenings. When I decided to participate in the Zeitouna program after following Karam’s work from my home in Australia, I knew I had to create a very special project for the children. I worked with Karam’s director of education Kinda Hibrawi for weeks via email and Skype developing my curriculum. I envisioned an art project that a child could pass on and teach to another: a project that was suitable for all different ages; something that was bright, colorful and fun; an object that was simple in execution but also meaningful in its communication. But, most of all, it had to be a project that would be beneficial to the mental health of the children, as this particular Zeitouna mission was focused on holistic healing. 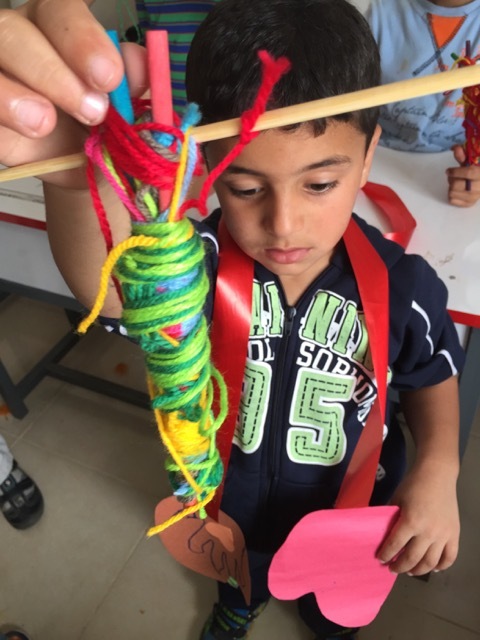 I decided to teach the Syrian children to make dreamcatchers. Dreamcatchers are rooted in Native American history. It is believed that, during the night, bad dreams become entangled in the dreamcatcher’s web and disappear as soon as the sun rises, thus allowing only good thoughts to enter your mind. From my studio in Australia, as I collected and organized all the supplies, the concept seemed so perfectly simple. But as our translator from Syria explained the process to the children when we first entered the classroom, I looked around at them squashed along the small school desks and wondered: how we were ever going to be able to make this work? I needn’t have worried. The children took great care in winding lengths of coloured knitting wool, threading and tying feathers, and choosing special beads for their very own dream catcher. Very quickly, they recognized their own personal creative space and developed dreamcatchers I could not have ever imagined. I witnessed a level of tolerance and caring for one another beyond their years: they swapped wool colours and beads and helped each other. I remember being in some classes where there were around 30 young primary school children and the entire room was silent. The energy and intent that was poured into each child’s work was palpable. Some children took great care in matching the wool colours to the outfits they were wearing on the day. Others carefully placed colours neatly next to each other to make patterns, while some just wound and wound the wool, crisscrossing in every colour available to make sure not one bad dream would get through. One little boy’s wool was so tightly wound that the wooden triangle collapsed and his Dream Catcher was an oblong shaped spear. ‘Who needs triangles anyway?’ commented a friend on social media upon seeing the photo. I told the boy that I thought his dreamcatcher was a very, very special one for a very, very special person. I loved it! When the children found out they could actually keep what they had made, some were close to tears. I realised the impact that the workshops were having – they really did want to chase away their bad dreams. They believed in their dreamcatcher. I learned how inventive and resourceful all of the children were with what they have – they make do. I had to improvise on many occasions, thinking on my feet, but they always jumped straight in, thinking ahead and working alongside me patiently. One child wore the dreamcatcher as a headdress, and another tied a very long loop and wore it as a necklace. These ideas took off, and many others celebrated together with their personalised works. Other children began beading necklaces and bracelets, putting feathers in their hair and behind their ears, plaiting wool into bracelets. Seeing this creative energy in the young children was very rewarding. Every single dreamcatcher was a success story because of these children’s resolve to experience joy wherever they can find it. As I write these words from my studio in Australia, I hope every child has their dreamcatcher, wherever they sleep in Reyhanli, to chase away all the sad and terrifying nightmares they have witnessed, because every child deserves to have beautiful, colorful and happy dreams that match their beautiful, innocent spirits. You can read part one of the #NotInvisible Series here. Karen Black is an Australian artist whose work focuses on the human condition and the tragedy of war.